Many people know that plants can cause disease due to bacteria if ingested after not being properly cleaned. The most well-known of these diseases is e.coli or listeria. However, what many people don't know is that plants themselves can also get diseases caused by bacteria that damage the integrity of the plant's cells. While most bacteria are harmless to plants, there are some varieties that can cause tremendous destruction to the plant and kill it. These are plant pathogens. What do Bacterial Diseases in Plants Do? Like all living things, plants require a certain amount of bacteria to both survive and to thrive. There are good bacteria and bad bacteria for plants as well as for animals and humans. The absence of bacteria can lead to immunosuppression in all living creatures, which is why maintaining a balance of good bacteria is necessary and even beneficial. Bad bacteria are known as pathogens and are actually detrimental to the life of plant cells. Bacterial pathogens in plants can affect the strength of the plant's stalks, leaves, petals and roots. This can be particularly damaging when pathogens may infect a plant and travel through the soil to other nearby plants of the same or similar varieties, infecting them too. For this reason, if a gardener or farmer suspects that there may be a disease in one of their plants, they should take action immediately. In some cases, pathogens will weaken but not kill plants, while in others the bacteria kill the plants outright. Symptoms of bacterial pathogens in plants can include cankers or other marks on the plant leaves, leaf overgrowth, spots, wilting and other behavior. 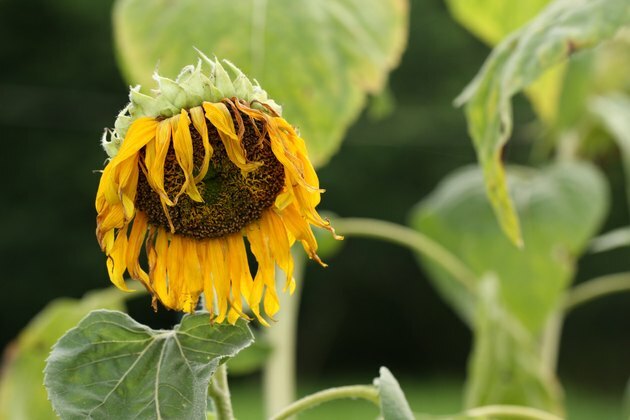 While many people often attribute these symptoms to overwatering or underwatering or to the wrong amount of sun exposure, the truth is that it's likely a plant disease caused by pathogens. This is why if a plant doesn't look right, it's a good idea to take the time and see if it's a watering issue or is something more serious is at play. Pathogens can be broadly defined as any variety of bacteria that has negative or malignant effects on its host. In the case of plants, pathogens are any of the small species of bacteria that actually harm plants as opposed to helping them. Many people are unaware that plants can get bacterial infections just like people do, and just as with people, these diseases and infections can be spread quickly and easily from plant to plant. Preventing the spread of pathogens means remaining vigilant and aware. It's extremely easy to write off weird spots, a lack of growth and other abnormalities to things like a lack of sunlight, inconsistent watering or extremely dry weather. However, being aware of the symptoms of bacterial pathogens can help you recognize when something more serious may be going on with your plants. The sooner you recognize that a pathogen has infected your plant, the sooner you can take action to cure, correct or stop the spread of the disease. Intervention may take the form of chemicals or cutting and moving the plants to a new location. If the pathogen is in the soil, it may require inoculating the soil before you can safely replant. Occasionally applying a chemical to kill bacterial pathogens may also harm your plants. What Plants Are at Risk for Bacterial Disease? For the most part, it's plants that exist in tropical and subtropical conditions that are at the greatest risk for bacterial pathogens and related diseases. Blight is one of the main bacterial diseases affecting plants, and it's most prevalent in damp and moist conditions, such as those found in tropical climates. Certain plants are more susceptible to pathogens than others. You may want to research which plants these are if you haven't already begun planting. This can help you choose some that are more resistant or at least know what to look for in spotting sick plants. Knowing which plants are at risk can help you manage your crops or your garden more efficiently. Members of the Asterales family are susceptible to a bacterial disease known as aster yellows. The Asterales family contains over 1,200 species including the common flowers asters and daisies and other foliage. The condition is transmitted by insects known as leafhoppers, and although it's not generally deadly for plants, it can yellow the stalks, leaves and offshoots and generally dwarf the growth of the plants. Blight is a bacterial infection that can affect plants and crops like the potato leaf, corn plant and bean plant. Blight is characterized by the yellowing or browning of the leaves of a plant and the death or withering of its stalks and roots. Canker is a bacterial disease that occurs most often in woody plants. Sunken, swollen and discolored pits on a plant's limbs, branches or trunk are symptoms. Trees and bushes can also be affected. Generally speaking, plant pathology is simply the study and exploration of diseases that plants suffer at the hands of pathogens. These are generally caused by the presence of harmful bacteria as a result of environmental conditions. Plant pathology is a critical field of study. Plants and plant growth are required not only for the production of food and medicine but also for the cleanliness of oxygen and our natural environment. When plants begin to fall sick and die, we lose valuable crops, which affects our health, environment and the economy. Plant pathologists must examine plants that show symptoms of bacterial infection. The goal isn't simply to save the plants that are affected but to discover the reason for the infection and sickness in the hope of preventing the spread of the illness to other plants in the area. This is critical, particularly for large-scale growing operations like commercial farms. 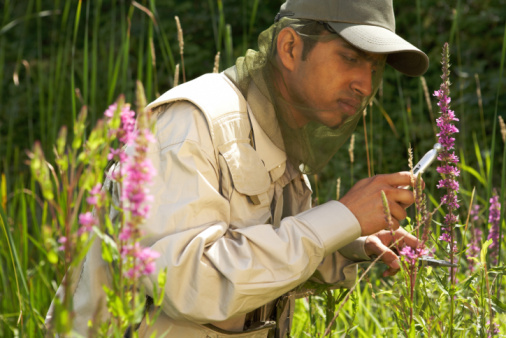 Because plant pathology can destroy natural resources and food sources, careers in the field are numerous and varied. Pathologists are often found in the developing world, helping to figure out ways to keep crops healthy and eradicate bacteria. In developed nations like the United States, they may have jobs in fields like biotechnology or academic research or may work on farms or in laboratories dedicated to food safety management. What Plant Diseases Are Caused by Pathogens? There are numerous plant diseases that are caused by pathogens. Some are deadly to the plant and can be spread to other plants. Others may only damage existing plants and stunt their growth. This is undesirable and can be disastrous, especially for plants that are relied upon to produce a harvest. Leaf curl is an example of a plant disease that's typically caused by pathogens. As the name suggests, the effect of this illness is that the leaves of a plant will curl up, wilt and, in some cases, die. This disease prevents plants from fully thriving and producing their fruit or flower. What Other Plant Diseases Are Caused by Pathogens? Wilt and stunting are two conditions that can be caused by pathogens but can also be a symptom of overwatering, underwatering or excessive temperatures. In the case of wilt, plant leaves begin to wilt, look weaker and droop where they used to be robust. Stunted plants, on the other hand, are generally smaller than they usually are and don't yield their traditional crop fruit or flower. Brown spot disease is a bacteria-related plant illness that's seen most typically in climates that are both hot and humid. The disease is characterized by a white oozing spot on the plant and is often present on the fruits of the plant themselves. This disease often results in a decrease in the plant's yield. This is most common in vegetable plants and decorative plants. Crown gall disease is a bacterial plant disease that comes from the soil. The disease is called crown gall because "galls" or outgrowths begin to form at the places where the stems and roots of a plant intersect. The disease is the result of interference by a bacterial pathogen known as Agrobacterium tumefaciens. There are two ways to treat crown gall disease. One is to apply a chemical compound that kills the bacteria. The other is to vaccinate any cuttings and new transplants to the soil with a bacteria that will attack and outpace the pathogenic one. How Does Bacteria Cause Disease in Plants? The growth and spread of bacteria within plants is difficult to control. Bacteria can travel through the soil to other plants or can be spread with gardening tools that move from one plant to another. Insects and other flying creatures that may land on leaves or blossoms before moving on can also spread bacterial disease. The bacteria harm the plant by breaking down or weakening the plant's cells. This is shown when stalks, leaves or flowers are harmed or otherwise begin to wilt or deteriorate. The truth is that most bacteria are actually saprophytic bacteria, which are highly beneficial to plants. There are only about 200 pathogenic species of bacteria, and nearly all of them are classified as parasitic. Parasitic bacteria can attach itself to plants either on the leaves, through the soil, inside the plant or in plant debris. Some parasites can survive inside water and even inside other insects. Learning the survival criteria for different parasites can help you prevent infection and stop ones that already exist. How Can You Tell if Plants Are Infected? There are several warning signs to watch out for when determining if your plant or crop is infected. The issue is that many symptoms of overwatering, underwatering or exposure to too much sunlight can mimic the effects of bacterial infections. If you suspect that something is wrong with one of your plants, it's a good idea to keep a close watch to rule out bacterial infection as a possibility. Spots on the leaves are often the first thing that plant diseases caused by pathogens make visible. Bacterial spots may appear not only on leaves but also on stems, fruit and flowers of the trees. Swift-moving and quickly multiplying spots may indicate the presence of blight. Also typical is bacterial ooze, a symptom that can definitively point to an infection. Bacterial scabs may appear on fruits and flowers. These are often symptoms that affect below-ground dwelling plants like potatoes or carrots. This is a particularly dangerous and insidious variety of bacteria because it leaves the door open for rot. Rot can gain entry into a plant through these scabs and cause significant further destruction.